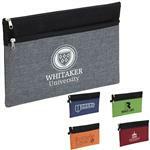 Want the ultimate pouch set to organize you tech, toiletries or cosmetics. This is the pouch set for you - The Avery 3 piece cotton pouch set. 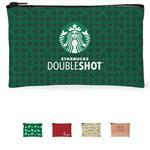 Top zippered closures secures contents of each pouch. Coated canvas zipper pullers and the pouches include D-ring tabs to keep them connected with a ball chain attachment. 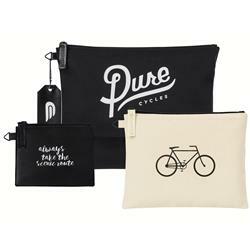 Customizable decorative tag adds a creative way to brand your bag and decorative tag is made of coated canvas. 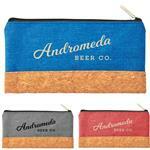 Pouch Dimensions: Small Coated Canvas: 4L 5.25H; Medium Partial Coated Canvas: 6.5L 8.25H; Large: 9L 11.25H. 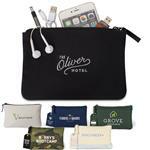 This is a great custom tech or travel pouch set. Production Times Available: 5 Working Days or Rush Production Available.